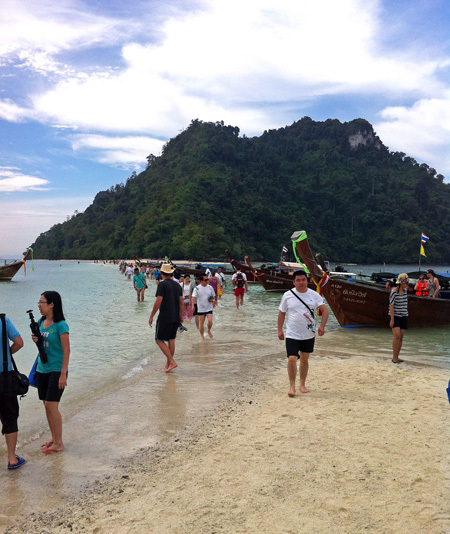 One of the best day trips a visitor to Krabi can go on is the Four Island Tour. 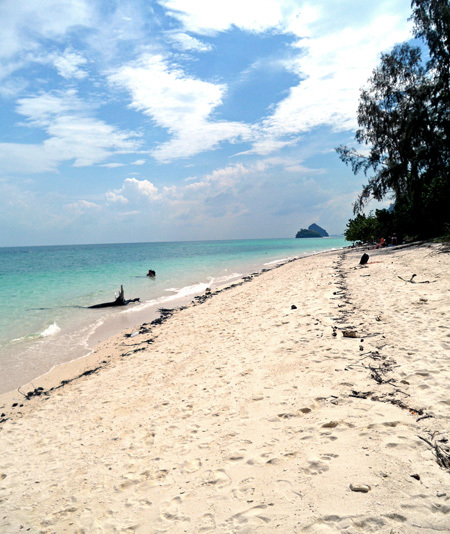 While there are beautiful beaches on Krabi’s mainland like Ao Nang Beach or on the larger, inhabited islands of Koh Lanta or Koh Phi Phi, we find that some of the most stunning beaches can be found on the smaller, uninhabited islands. Here we have seen the whitest sand and most crystal clear, turquoise waters. It almost seems unreal and makes me feel like I am part of a “Pirates of the Caribbean” scene. 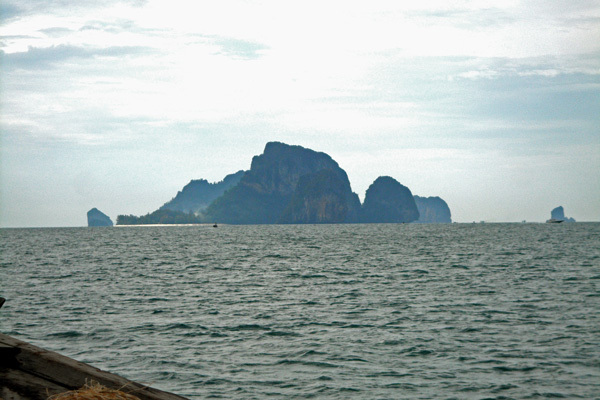 Most day trips by boat from Krabi will stop at some of these tiny, picturesque islands. But by far the best value can be had on the Four Island Tour by long-tail boat. For only 400 Baht (~$13) transfer to the boat, a visit to Poda Island, Tub & Mor Island, Chicken Island with opportunity for snorkeling and Phra Nang Beach is included. A ‘buffet’ lunch and drinking water are also part of the package. The day starts with an early morning pick-up at around 8 am from the hotel or guesthouse in Krabi Town (probably a little later from Ao Nang). Transport is in a large truck with three long benches in the back (like a giant version of a songthaew) and it is squeezed full to the last inch – probably 30-40 people. I wasn’t really bothered by this, since we had booked a ‘budget-style’ tour, but it turned out that other passengers were actually going on more expensive speed boat trips. Everyone gets dropped off at one collection point on Ao Nang beach, where the masses get sorted according to their trip type and corresponding color-coded stickers are handed out. For a while it is kind of crazy and disorganized with everyone waiting on the sidewalk – but as the different boats are starting to leave, things get more orderly. After the first half hour ride we arrive at Tub Island. There is an interesting phenomenon here, as the ocean is somehow divided between Tub and Mor Island, so that at low tide you can walk between those islands. It was almost high tide when we got there, but we still could walk on the connecting sand bank, however at times we were about knee-deep into the water. It is not the smoothest walk due to sharp shell and coral pieces and water shoes would have been a great idea. We tried to go for a swim after the walk, but around here – there seem to be many large rocks in the water, making swimming nearly impossible. Right after Tub Island, Chicken Island comes into view. Once you see it, there is no question where the name is coming from. 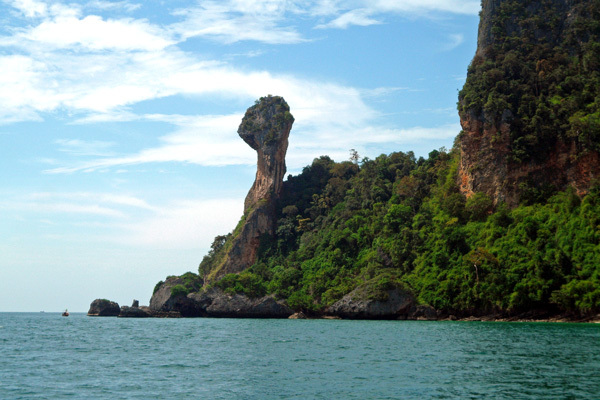 A long, narrow rock formation is protruding from the island that from certain angles looks exactly like a chicken head. We didn’t go onto Chicken Island (not sure if its possible even, since it all looks like rock only), but we stopped in view of it – where we had the opportunity for snorkeling. Goggles and snorkels are provided, but no fins. I was hesitant at first due to a previous, painful experience of stepping onto a sea urchin during a similar snorkeling venture without fins. 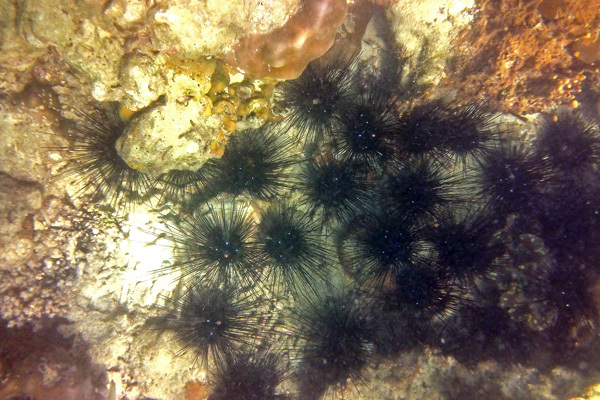 But when I learnt that it was high tide and the corals were several meters below sea surface, I felt at ease. For someone who has had amazing snorkeling experiences before, the varieties you get to see here can be a little disappointing. 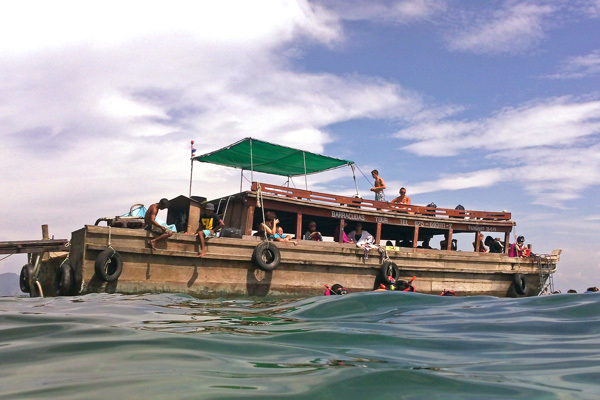 But for snorkeling novices it can be a memorable experience nonetheless. 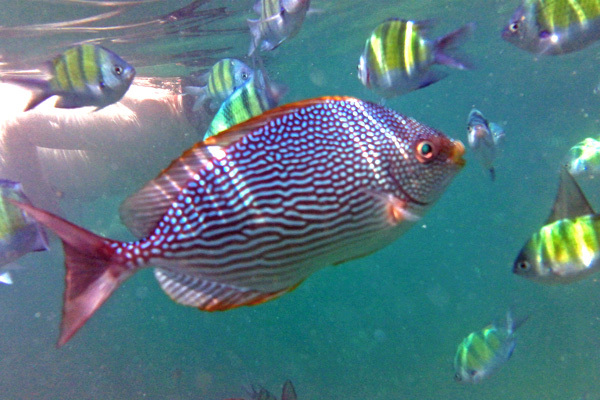 We did this trip with my sister and this was her first snorkeling experience of this sort. She absolutely loved it! All the swimming and snorkeling makes one hungry, so the lunch buffet on Poda Island comes just in time. It is a simple selection of rice with vegetables or chicken as side. We finished it quickly so we’d have more time to enjoy the absolutely stunning beach here. It was truly amazing. Whiter than white sand and warm, turquoise-blue water that was super-clean and clear. This is one of the benefits of an uninhabited beach – no waste water being dumped close by. Can you see why the island is named Poda (means ‘turtle’)? The last stop on this trip brings us to Phra Nang Beach, which is one of the bays of Railay peninsula. We had never made it to this beach on our previous Railay visits, so it was really nice to get to see it this way. The beach here offers some stunning views with limestone karsts rising majestically out of the center of the bay. Another attraction here is Phra Nang Cave. A giant opening in the mountain side with stalactites and stalagmites. 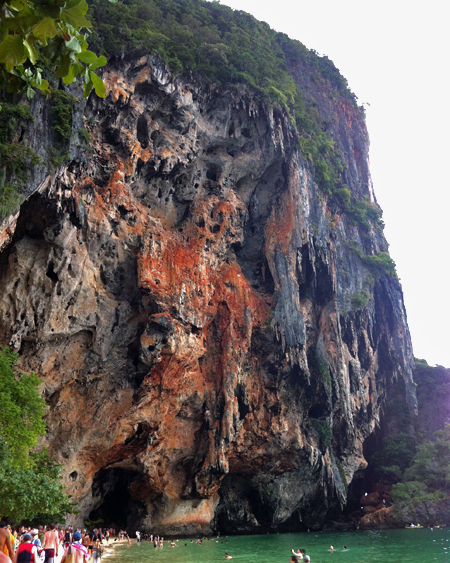 This cave is also an offering place for the local fishermen. The incredible number of small and large lingams leave no question as to the purpose of the offerings to the sea princess (Phra Nang) believed to live in the cave: Fertility! (and good fishing luck). 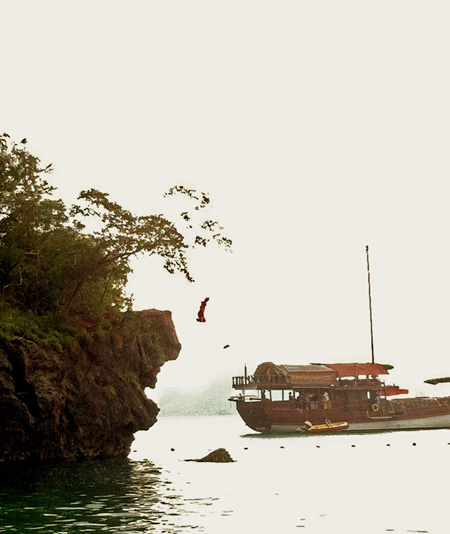 Right by the cave there is a spot that offers an opportunity for cliff-jumping. Of our group only my sister was brave enough to dare it. It was high tide so she had to swim across a little part of the bay and climb to the top of the cliff. Then it is a jump of about 10 m (35ft) into the water. After visiting the quiet beaches beforehand, Phra Nang Beach seems quite busy and crowded almost. There are many people from day trips or from the hotels by the beach. In one section there are long-tail boat vendors lined up in the water. From their boats women were selling fried rice and noodle dishes and grilled corn was very popular as well. At this point in our day it started raining and everyone hurried back to the boat where slices of juicy watermelon were waiting for us. Once everyone had made it on board we headed back to Ao Nang beach and from there were transported back to our accommodations. Just as with most other budget tours/trips there are also negative aspects and I don’t want to neglect mentioning these as well. When we were first escorted to our boat, I was surprised to see that the advertised ‘long-tail boat’ was actually huge and much unlike the long-tail boats we had taken to Railay. I think the organizers will just use this big boat, instead of taking several actual long-tail boats, if a large number of people book the Four Island Tour for that day. I totally would have preferred a small long-tail boat. As instead of the expected 10 people, there were probably close to 100 passenger on one big boat. This seemed like a total over-load since some people had to sit on the roof to find room and the boat always had difficulties to get going from one beach to the next. At the beginning I was a little annoyed by this unexpected turnout. First of all, the sheer amount of people drastically increased the time it took until everybody got on and off board and with this decreased the time we had to actively spend on the islands or snorkeling. Further, there also were many children and elderly people who had a hard time climbing the step ladders on the sides of the boat. For these age groups it was definitely not a suitable boat for this trip. However, we realized it would be easy for us to make it off the boat as one of the first every single time – escaping the masses and giving us more time to enjoy the islands. Another little annoyance was the fact that – as so often – the advertised “everything included” (meaning no extra costs) turned out to be not true. Once on board, we were told we had to pay an extra 10 Baht ($0.30) per person due to some new “island waste regulations” for Poda Island. The guide tried to explain something along the lines, of how every tour group usually has lunch on Poda Island. To cope with the clean-up no packaged lunches were allowed anymore (so it would be buffet-style) and a 20 Baht fee was put in place. But since they are a large tour agency, they got a discount and it is only 10 Baht. It all didn’t quite make sense and we could have cared less about the 10 Baht. It just seemed so typical, which made it kind of frustrating. To add to this nonsense, at lunch time – once the last passengers made it off the boat – there was only plain rice left, which obviously left them disappointed and upset. Another indication to me that the boat was way overloaded. I felt sorry for the poor guide who was left in charge for this large group – but what could he do? Of course he had to take all the complaints and was the target of passengers’ frustrations, but he kept calm and professional and advised those, who hadn’t received a proper lunch, to ask for a refund at the agency back on shore. However, besides these little frustrations here and there, we called to mind how little we had actually paid for this trip and then it wasn’t hard to just make the best of this tour. Aside from the just mentioned frustrations, we quite enjoyed the 4-Island Tour. The islands and beaches offer amazing natural sights and considering the low price, there really is no reason to complain. If I were to go on this trip again, I would inquire and make sure that the tour truly is by a long-tail boat. On Poda Island we also met a gentlemen who told us his group had simply hired a long-tail boat with boatman for the day without a tour agency. Every boatman knows the location of these islands and this way you have the freedom to decide as a group how long you want to spend at each spot. According to this gentlemen it cost them 2200 Baht as a group – so if you get about 5-6 people together, you’ll come out similar to the tour ticket price. However, you’ll have to look after your own lunch and snorkeling equipment. 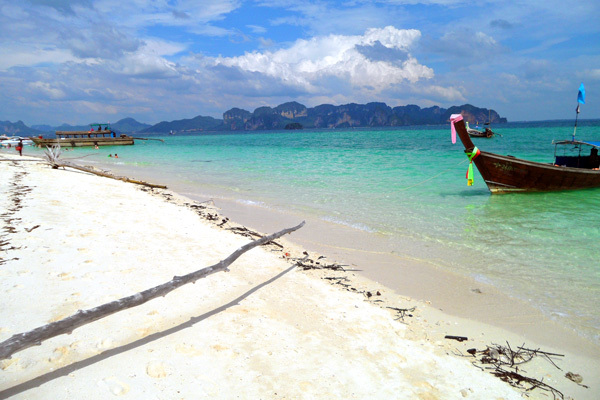 Whichever way you choose, the islands and beaches close to Krabi’s mainland are definitely worth a visit! Aonang beach is stuning food and travelling tour shops along the beach for visitors aroundthe clocks really amazed connect trip to koh tao nangyaun .koh samui…phuket..or arrange one day trip to 4islands. Kai. Lailay. Poda. Viking cave. Phra nang bay. Ppdon.Pplay. maya bay…highlights beauty shotscenes movie of The beach 2004.played by dicaprio. I’m so excited to go to Krabi on Wednesday. Moreover after I read ur post. I’m thinking to take the 4 islands tour by longtail boat but am still looking for the agents. What travel agents did u use back then? It’s quite cheap but yes I have to make sure that they will take us with the real longtail boat. 🙂 thank u! 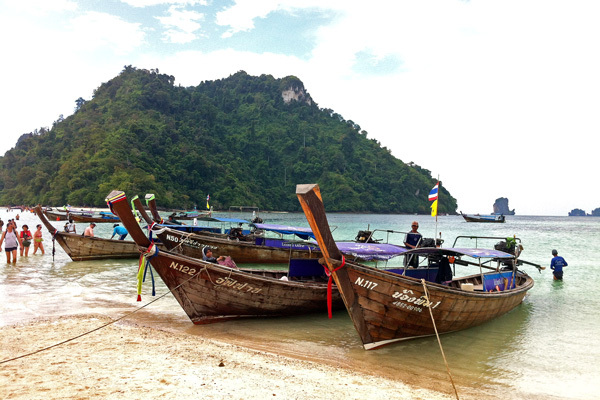 Honestly, to do the 4 island tour by long-tail boat, just go directly to the pier in Krabi town (or Ao Nang). Just negotiate a deal with one of the boat guys and you should be fine – no need for the middle man (travel agent). There are plenty of travel agents I doubt they would put you in a small long-tail boat. 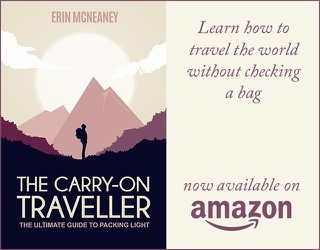 They generally put you in a big boat or bus with a million other tourists – which is what happened to us until we learned to by-pass the middle man where possible. This sound fantastic! You realy got me into Thailand! It looks so amazing. I live in Kenya 5 years and now I am seriously thinking to change the place. This is maybe litle bit out off the topic..Is it also possible to live there? I mean is it secure. Or it is suitable only for the tours and holidays? I am going to Kabi in April and am not great on boats. 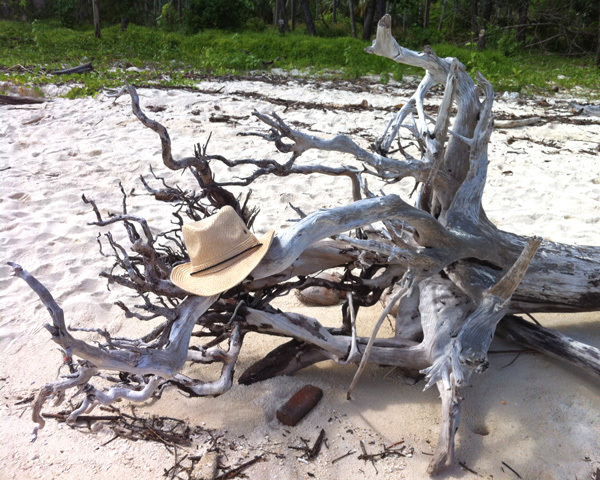 I am thinking of taking fhe 4 islands tour. Is it fairly close to Krabi , and are the seas particulary choppy in that part?